Largest selection of Butterfly indoor table tennis tables in the UK. Lowest prices. All with free delivery! 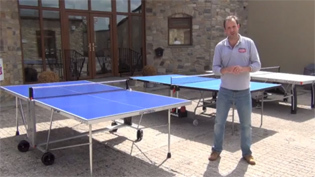 Lots of useful info on Table Tennis Tables, both indoor and outdoor, explaining the key features to look for. We recommend the best ones to buy in the Economy, Mid-range and Premium price points. With lots of models to choose from we simplify the jargon and make it easy to pick the right one for you to play with your friends and family. Butterfly is the world's leading table tennis brand, created by the Tamasu company of Japan in 1954. For most of the last 50 years, Butterfly have been at the forefront of the development of top performance table tennis equipment. The evidence of this is a vast list of World, European and Commonwealth champions who have used Butterfly equipment over that period including the England Team. We stock a great selection of Butterfly Indoor Table Tennis Tables. Whatever you are looking for, we should have covered. If you have any queries at all, just give us a call on 0800 622 6464 and one of our friendly expert advisors will be able to help you. We have a range of indoor table tennis tables, outdoor table tennis tables styled as static table tennis tables and foldaway table tennis tables. The rollaway table tennis tables are proving very popular, as they offer superb gameplay along with the ease of being stored away when they aren't being used. A selection of the Butterfly range of table tennis tables come part-assembled, so you can be ready to play almost immediately. All of our Butterfly tables come with free accessories, so you have everything you need to start playing as soon as your table tennis table arrives. All of our table tennis accessories are of a high quality to match the quality of the table tennis table purchased. If you have any questions about anything we sell please give us a call on 0800 622 6464 and one of our friendly expert advisors will be happy to help you.